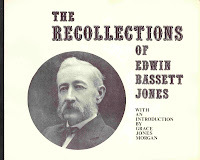 Grace Ethel Jones was the daughter of British-born parents, Edwin Bassett Jones (1846-1916) and Emily Dunkley (1851-1926), whose families emigrated to Canada when they were very young. 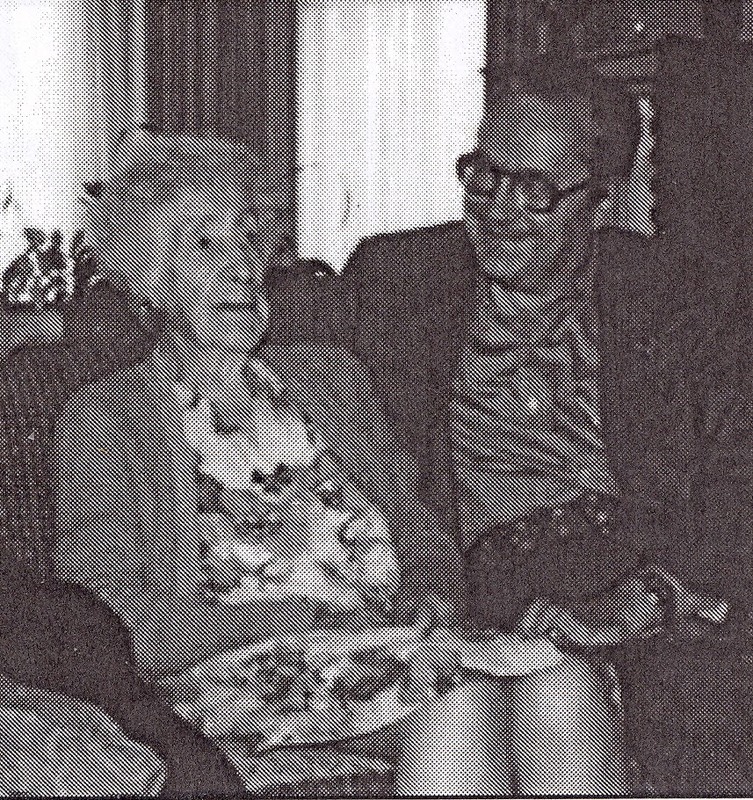 Grace Jones had two older brothers; the family grew up in Chatham, in southwestern Ontario, where Edwin Jones was Waterworks Superintendent and City Engineer. Grace Jones married Thomas Russell Morgan (1881-1930s?) on 20 August 1905; the couple had one daughter and one son. They emigrated to the United States around 1918, settling in Alameda, California, where Grace Jones Morgan died in 1977 at the age of 92. 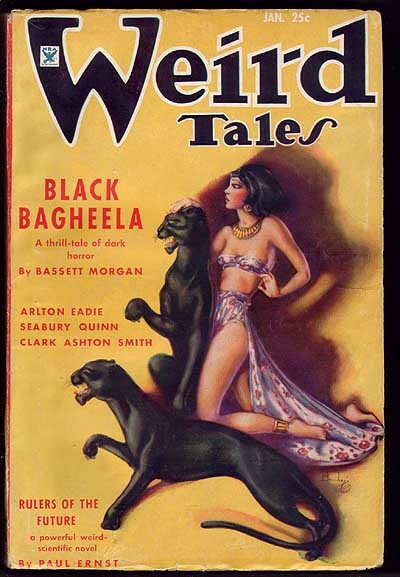 She is best remembered as a contributor to Weird Tales, in whose pages she published thirteen stories, between 1926 and 1936, under the pen-name “Bassett Morgan,” which was made up of her father’s middle name combined with her own married name. 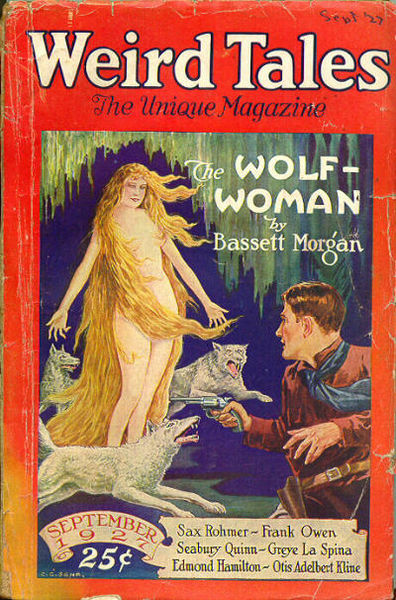 And though she also contributed to Ghost Stories, most of her writing appeared outside the weird-fiction field in periodicals ranging from The Royal Magazine, Cassell’s Magazine, The Smart Set, Argosy, All-Story, Munsey’s Magazine, Sea Stories, Boy’s Life, Woman’s Journal, Top Notch, and Black Mask, among many others. She also published three novels, two under her real name and the third under her pseudonym. 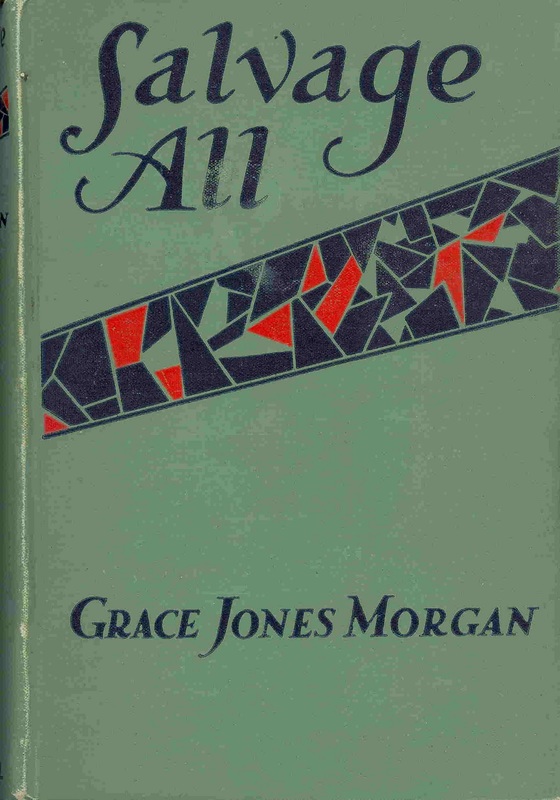 Salvage All (New York: Thomas Crowell, 1928; London: Grant Richards, 1928), as by Grace Jones Morgan, concerns a young street waif at a British Columbia seaport, and the men who seek to aid or abuse her. Tents of Shem (London: Sampson Low, Marston & Company, 1930), also published as by Grace Jones Morgan, is a complicated story of a reckless young woman, born of an old Irish family and a San Francisco dancing girl with lax morals, who could not escape her heritage. The Golden Rupee (London: John Long, 1935), as by Bassett Morgan, is a South Sea adventure of young Captain Paradise, who murders a leper and takes the man’s treasure, including an intricately beautiful model of a ship called the “Golden Rupee.” Captain Paradise has a vessel built to this design, but he is fated never to sail in it, as he is killed by a rival the night before his wedding, and his rival takes the ship. However, the ghost of Captain Paradise still rules over the lives of those who had known him, with tragic results. In 1974, under her full name Grace Jones Morgan she introduced and self-published an edition limited to one hundred numbered copies of her father’s autobiography, The Recollections of Edwin Bassett Jones. This gives some accounts of his amateur archeological work, including his finds of Indian artifacts and of a mastodon. NB: An earlier version of this entry appeared in my column “Notes on Lost and Forgotten Writers” in All Hallows no. 42 (October 2006). Robert Weinberg, Stefan R. Dzemianowicz, Martin H.
Your list does not include Tiger published in Strange Tales, March 1932, and in Strange tales reprint #4 by Wildside Press. Hi: It's a cropped version from some collection of Forrest J. Ackerman's personal photographs, called (I think) Famous Forry Fotos, or Famous Forrie Fotos. Your website looks like a good idea, but while I find that there is supposed to be a completed entry for Grace Jones Morgan, I can't access any entry itself, nor any other "completed entry". The other link was to the blog I maintain in the interim, while we complete our research and coding of the new, expanded entries. Douglas A. Anderson is the author of The Annotated Hobbit (1988; revised and expanded edition 2002). He is currently Book Reviews Editor of the peer-reviewed online Journal of Tolkien Research (founded 2014). His anthologies of fantasy literature include Tales Before Tolkien (2003) and Tales Before Narnia (2008). More Tales Before Tolkien is due out in 2018. He is also managing director of the small publishing firm Nodens Books. Besides his blogs on Tolkien and Fantasy (mostly Tolkien-related) and A Shiver in the Archives, which highlights literary discoveries, he contributes to the blog Wormwoodiana, devoted to classic "literature of the fantastic, supernatural and decadent." And for those with even more rarified bibliophilic tastes, he also does a personal blog for Lesser-Known Writers. Links to recommended online articles can be found at Blinks: Read and Recommended. Valancourt Books Spring Cleaning Sale! (c) 2011-16 by Douglas A. Anderson. Simple theme. Theme images by bopshops. Powered by Blogger.